Mohammed Subhaan with his KBW coaches following his Yorkshire Championship victory over Callum Grace. The Dewsbury boxer now moves into the pre quarter-final stage of the national championships. 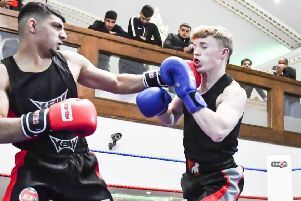 Dewsbury boxer Mohammed Subhaan claimed a third victory over old rival Callum Grace to be crowned Yorkshire Champion at 56KG. Subhaan, boxing out of the KBW Gym in Savile Town, had boxed Platinum ABC’s Grace on the two clubs respective shows and had won on both occasions. The third meeting had an extra incentive with the Yorkshire title on the line and chance to move into the pre quarter finals of the England Youth National Championships. The Yorkshire finals were held at Sheffield Works Sports and Social Club. There was no feeling out process in the opening round as both boxers were familiar with each other’s style and wasted no time in meeting in the middle to trade blows. The crowd were engrossed with action that was taking place in the first round as each time one boxer landed a blow, the opponent would land a counter attack and it was hard to chose who had taken a very close opening session. Subhaan’s corner instructed him to use his jab to take control of the bout. Grace came out for the second round trying to stamp his authority but Subhaan boxed to instructions and kept his opponent at bay. Every time Grace came rushing in, Subhaan would land a solid one-two followed by a hook to the body to slow his opponent down. There was not a lull in the action and the referee didn’t have to break the men at any point as both boxers were allowed to work and put on a entertaining show for the crowd. The third round was a carbon copy of the first as Subhaan and Grace both locked horns and began exchanging blows. The action was back and forth, with the main bulk of the shots landing to the body from both boxers. Midway through the final round, Subhaan broke away and started using his favoured jab once more, catching Grace with the more telling blows to catch the judges eye. The bell finally rang to end the bout and both boxers embraced at the end, in a show of real sportsmanship. Before the MC announced the winner, he asked the crowd for a round of applause for both fighters, who put on an excellent fight and it was Dewsbury man Subhaan who was declared the winner by a spilt decision. The KBW boxer now moves on to the pre quarter finals to be held in Leeds. Subhaan was supported by former amateur team mate, Saif Cheema, who recently turned into the professional ranks. After making a successful pro debut by way of second round TKO against Welshman Paul Lovell, Cheema will be boxing his second pro fight on Thursday March 29 at the Doncaster race course. Tickets will be available soon.